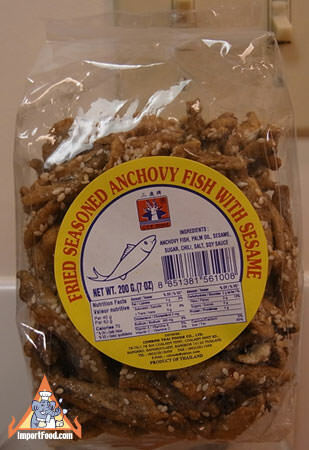 For years we've sold the very popular Shing Shang fish snack (above) from Thailand. We just got a new shipment of this similar product, and we like this authentic "local" version just as much. Small anchovies are seasoned, cooked, and packaged up so you can eat them as a snack individually, like cheetos. If you haven't tried the dried Thai fish snack, you could fall in love with it. No fish smell just a tasty natural snack, also good with jasmine rice. Sweeter than shing shang fish snack, with no noticeable spicy flavor even though chili is an ingredient. 7 oz is a generous quantity. Ingredients: anchovy fish, palm oil, sesame, sugar, chili, salt, soy sauce. Product of Thailand.